﻿ Fun Easy English - Environment - Global warming - Climate change Impacts on Coastal Areas. The coastline of the United States is highly populated. 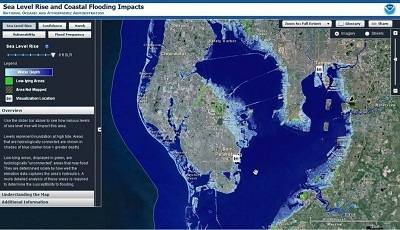 Approximately 25 million people live in an area vulnerable to coastal flooding. 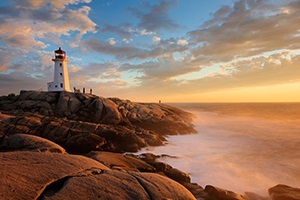 Coastal and ocean activities, such as marine transportation of goods, offshore energy drilling, resource extraction, fish cultivation, recreation, and tourism are integral to the nation's economy, generating 58% of the national gross domestic product (GDP). Coastal areas are also home to species and habitats that provide many benefits to society and natural ecosystems. Climate change can affect coastal areas in a variety of ways. Coasts are sensitive to sea level rise, changes in the frequency and intensity of storms, increases in precipitation, and warmer ocean temperatures. In addition, rising atmospheric concentrations of carbon dioxide (CO2) are causing the oceans to absorb more of the gas and become more acidic. This rising acidity can have significant impacts on coastal and marine ecosystems. The impacts of climate change are likely to worsen problems that coastal areas already face. Confronting existing challenges that affect man-made infrastructure and coastal ecosystems, such as shoreline erosion, coastal flooding, and water pollution, is already a concern in many areas. Addressing the additional stress of climate change may require new approaches to managing land, water, waste, and ecosystems. Since 1901, global sea level has risen approximately eight inches. In a particular location, the change in sea level that is observed will be affected by the increase in global sea level as well as land movement up or down. The motion of land can be caused by subsiding coastal lands, oil and water extraction activities, melting ice, or tectonic movement. The terms "local" or "relative" sea level refer to both the global change in sea level and the effects of land motion. Where the land is sinking, the rate of relative sea level rise is larger than the global rate. Some of the fastest rates of relative sea level rise in the United States are occurring in areas where the land is sinking, including parts of the Gulf Coast. For example, coastal Louisiana has seen its relative sea level rise by eight inches or more in the last 50 years, which is about twice the global rate. Subsiding land in the Chesapeake Bay area worsens the effects of relative sea level rise, increasing the risk of flooding in cities, inhabited islands, and tidal wetlands. Mostly because of these differences in land motion, estimates of future relative sea level rise vary for different regions. Climate change models project that global sea level rise will accelerate in the 21st century. Models based on thermal expansion and ice melt estimate that global sea level is very likely to rise between 1 and 3 feet by the end of the century. Typically, these models do not, however, incorporate all of the possible responses of ice sheets to warmer temperatures, which could further raise sea level, but is unlikely to add more than one foot. 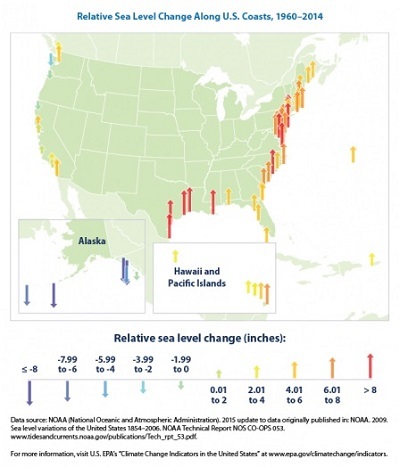 For more information on recent and future sea level rise, please visit the Science section. 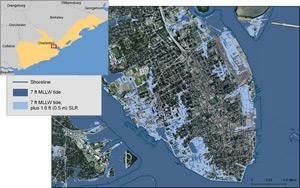 The National Oceanic and Atmospheric Administration has developed a tool to visualize the potential impacts of sea level rise on coastal communities in the United States. Growing populations and development along the coasts increase the vulnerability of coastal ecosystems to sea level rise. Development can block the inland migration of wetlands in response of sea level rise, and change the amount of sediment delivered to coastal areas and accelerate erosion. For example, coastal Louisiana lost approximately 2000 square miles of wetlands in recent decades due to human alterations of the Mississippi River's sediment system and oil and water extraction that has caused land to sink. As a result of these changes, wetlands do not receive enough sediment to keep up with rising seas, and may no longer function as natural buffers to flooding. Rising sea level also increases the salinity of ground water and pushes salt water further upstream. Higher salinity can make water undrinkable without desalination, and harms many aquatic plants and animals. Coastal areas are also vulnerable to increases in the intensity of storm surge and heavy precipitation. Storm surges flood low-lying areas, damage property, disrupt transportation systems, destroy habitat, and threaten human health and safety. For example, low-lying areas of New York City, Long Island, and New Jersey were flooded by several feet of water by the storm surge from Superstorm Sandy in 2012. Sea level rise could magnify the impacts of storms by raising the base on which storm surges build. Climate change is likely to bring heavier rainfall to some coastal areas, which would also increase runoff and flooding. In addition, warmer temperatures in mountain areas could lead to more spring runoff due to melting of snow. In turn, increases in spring runoff may also threaten the health and quality of coastal waters. Some coastal areas, such as the Gulf of Mexico and Chesapeake Bay, are already experiencing "dead zones." Dead zones occur when land-based sources of pollution (e.g., agricultural fertilizers) contribute to algal blooms. When the algae sink and decompose, the process depletes the oxygen in the water. As increases in spring runoff bring more nitrogen, phosphorus, and other pollutants into coastal waters, many aquatic species could be threatened. Decreases in precipitation could also increase the salinity of coastal waters. Droughts reduce fresh water input into tidal rivers and bays, which raises salinity in estuaries, and enables salt water to mix further upstream. Coastal waters have warmed during the last century, and are very likely to continue to warm in the 21st century, potentially by as much as 4 to 8°F. This warming may lead to big changes in coastal ecosystems, affecting species that inhabit these areas. Warming coastal waters cause suitable habitats of temperature-sensitive species to shift poleward. Some areas have recently seen range shifts in both warm- and cold-water fish and other marine species. Pollock, halibut, rock sole, and snow crab in Alaska and mangrove trees in Florida are a few of the species whose habitats have already begun to shift. Suitable habitats of other species may also shift, because they cannot compete for limited resources with the southern species that are moving northward. For more information on climate change impacts on species, visit the Ecosystems page. 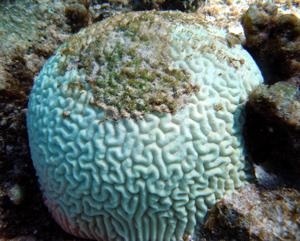 Higher sea surface temperatures increase the risks of coral bleaching, which can lead to coral death and the loss of critical habitat for other species. The rising concentration of carbon dioxide (CO2) in the atmosphere has increased the absorption of CO2 in the ocean, which subsequently makes the oceans more acidic. This trend is very likely to continue in the coming decades. A more acidic ocean adversely affects the health of many marine species, including plankton, mollusks, and other shellfish. In particular, corals can be very sensitive to rising acidity, as it is difficult for them to create and maintain the skeletal structures needed for their support and protection. Corals in the Florida Keys, Hawaii, Puerto Rico, and other U.S. territories are likely to experience substantial losses if CO2 concentrations in the atmosphere continue to rise at their current rate. Climate change threatens coastal areas, which are already stressed by human activity, pollution, invasive species, and storms. Sea level rise could erode and inundate coastal ecosystems and eliminate wetlands. Warmer and more acidic oceans are likely to disrupt coastal and marine ecosystems. Coastal development reduces the ability of natural systems to respond to climate changes. The Climate Ready Estuaries website provides resources for estuaries and coastal programs that are interested in learning more about climate change impacts and adaptation. To learn more about estuaries, visit the National Estuaries Program web page.